Have you ever tried real raw milk? Real raw milk comes from pastured cows, that has not been processed in any way—it is fresh, clean and nutritious! Raw milk contains multiple, natural, redundant systems of bioactive components that can reduce or eliminate populations of pathogenic bacteria. So powerful is the anti-microbial system in raw milk that when large quantities of pathogens are added to raw milk, their numbers diminish over time and eventually disappear. 1. Destroys pathogens in the milk. 2. Stimulates the Immune system. 3. Builds a healthy gut wall. 4. Prevents absorption of pathogens and toxins in the gut. 5. Ensures assimilation of all the nutrients. 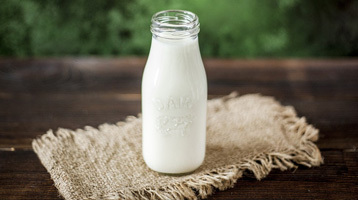 Early studies showed that children consuming raw milk had greater resistance to disease, better growth, and stronger teeth than children consuming pasteurized milk. Animal studies indicate that raw milk confers better bone structure, better organ development, better nutrient assimilation, and even better behavior than pasteurized milk. San Martin Milk Company Farm is the Fourth Certified Raw milk Grade A dairy in CA. It produces 100% Raw (non-pasteurized) whole milk from Jersey cows pastured at the in Morgan Hill, CA. These cows are raised on organic pasture not treated with pesticides and organic supplemental feed. None of the milking herd is treated with antibiotics.